Identification and characterization of Steroidogenic Factor-1 inverse agonists. Ghrelin Receptor: High Constitutive Activity and Methods for Developing Inverse Agonists. Constitutive activity and inverse agonism at the α1a and α1b adrenergic receptor subtypes. Assays for inverse agonists in the visual system. Application of large-scale transiently transfected cells to functional assays of ion channels and other proteins. Strategies for isolating constitutively-active and dominant-negative pheromone receptor mutants in yeast. Computational Modeling of Constitutively Active Mutants of GPCRs: C5a Receptor. 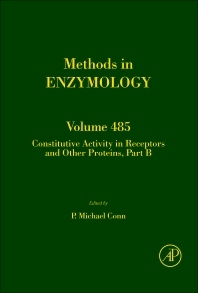 This volume of Methods in Enzymology covers the current methodology for the detection and assessment of constitutively active proteins. The chapters written by expert authors who are leaders in the field, provide hints and tricks not available in primary research publications.It is extensively referenced, with useful figures and tables throughout the volume.